This card can only be Special Summoned by removing 1 LIGHT and 1 DARK monster in your Graveyard from play. Pay 1000 of your Life Points to send all cards in both players' hands and on the field to the..
"When the ATK of a monster that attacks this monster is lower than the DEF of this monster, destroy the attacking monster. Damage calculations is applied normally.".. "FLIP: Select 1 Trap Card on the field and destroy it. If the selected card is Set, pick up and see the card. If it is a Trap Card, it is destroyed. If it is a Spell Card, return it to its original po..
You can remove this card from play until the End Phase of this turn by removing 2 DARK monsters in your Graveyard from play. You can use this effect during either player's turn. 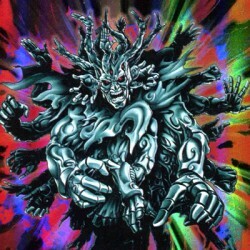 You can only use this ..
"When this card is in face-up Attack Position on the field, is a player activates "Pot of Greed", he/she can draw 1 more card.".. "When this card is Flip Summoned successfully, you can equip 1 Equip Spell Card in your Graveyard to this card.".. "When this card inflicts Battle Damage to your opponent's Life Points, your opponent draws until his/her hand has 7 cards.".. "If this monster is removed from play, Special Summon this card in face-up Attack Position on your side of the field during the End Phase of this turn.".. "If this card is in face-up Defense Position on the field, destroy this card. The controller of this card must attack with this card when possible. "..